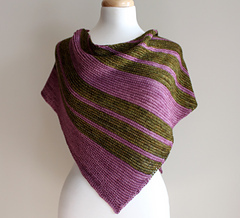 This striped garter shawl is worked asymmetrically from one corner point to the opposite edge. 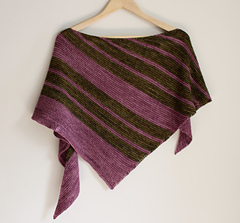 Simple increase and decrease stitches shape the shawl into a beautifully soft triangular shape. 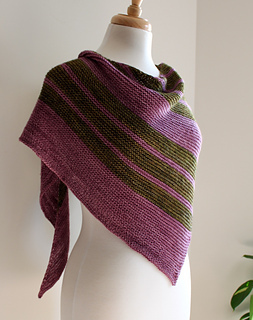 Choose two complementary colours to work the stripes and the frequent colour changes will help this project fly off the needles. 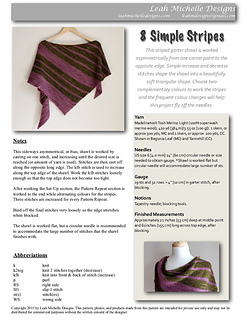 Pattern includes notes, list of abbreviations, diagram, and written instructions. 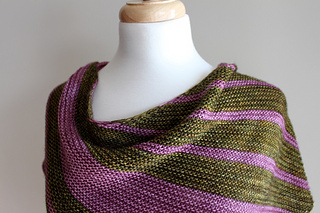 This pattern uses two colours of Madelinetosh Tosh Merino Light. The sample is shown in Begonia Leaf (MC) and Tannehill (CC). 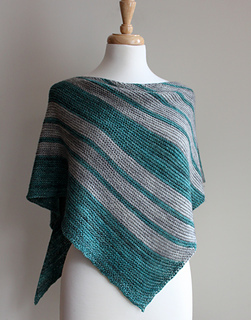 Approximately 300 yards of Begonia Leaf was used and approximately 200 yards of Tannehill. 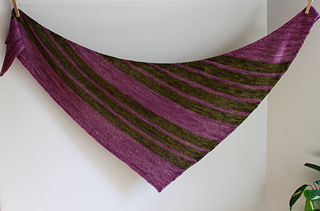 Finished measurements: approximately 21 inches (53 cm) deep at middle point and 61 inches (155 cm) long across top edge, after blocking. Skills required: increasing, decreasing, blocking. Stitches used: k, p, sl1, kfb, k2tog.